A few years ago, I underwent a series of brain MRIs as the migraines I had had since a teen were increasing in frequency and intensity. While discussing my case with one of the many physicians I had occasion to visit, he had the most recent high resolution MRI on a screen in front of him. Instead of looking at me, he kept his focus on the screen, but continued to talk. The more he stared at that screen, the more alarmed I became, until I finally asked: "Is there something else I should be concerned about, like dementia? He laughed and finally turned to face me with a smile: "No. How old are you, again?" I was 47 at the time. Doc: "According to this, your brain looks like a twenty-year-old. What do you do?" I told him I was an attorney. He nodded and followed up with: "Yes, I know, but what else do you do?" "Oh, I knit, design knit-wear, weave, read, write, and like to entertain friends with cooking..."
My answer was met with a broad smile. "Keep doing everything that you are doing, it shows." Fortunately, I have always enjoyed learning new things and pushing the bounds of what I think I know. My father always warned me against being intellectually arrogant. He pounded into me that the first step in learning was admitting that I did not already know. Therefore, I approach things with the assumption that I do not already know, which opens me up to welcome new and different ways of doing and seeing things. When I first began weaving on my first multi-harnessed loom, a Schacht 25" 8-shaft table loom, I taught myself (through books and YouTube) to warp it front to back. 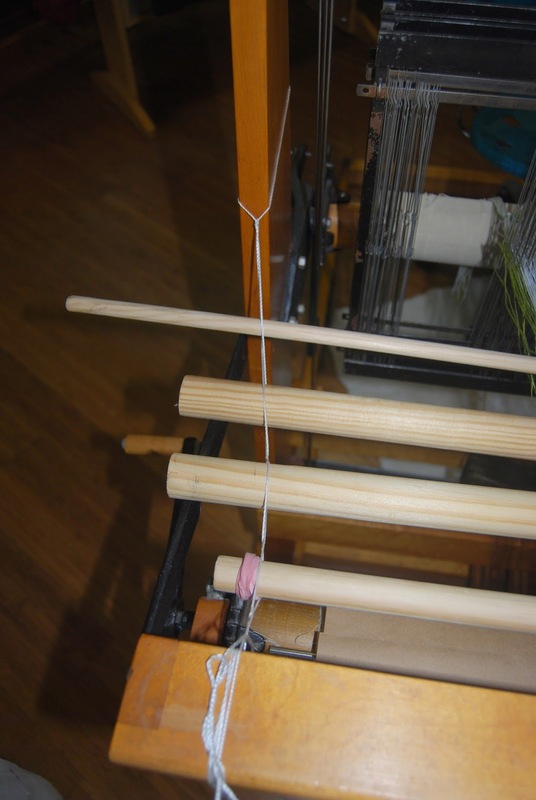 One day, I came across a blog post where someone wrote a tutorial about warping a loom back to front. It looked interesting, and, perhaps, a bit easier than what I was doing. So, I ordered a raddle from Handywoman to fit the loom, and tried my hand at back to front. I ended up really liking the back to front warping, and totally abandoned the front to back method. 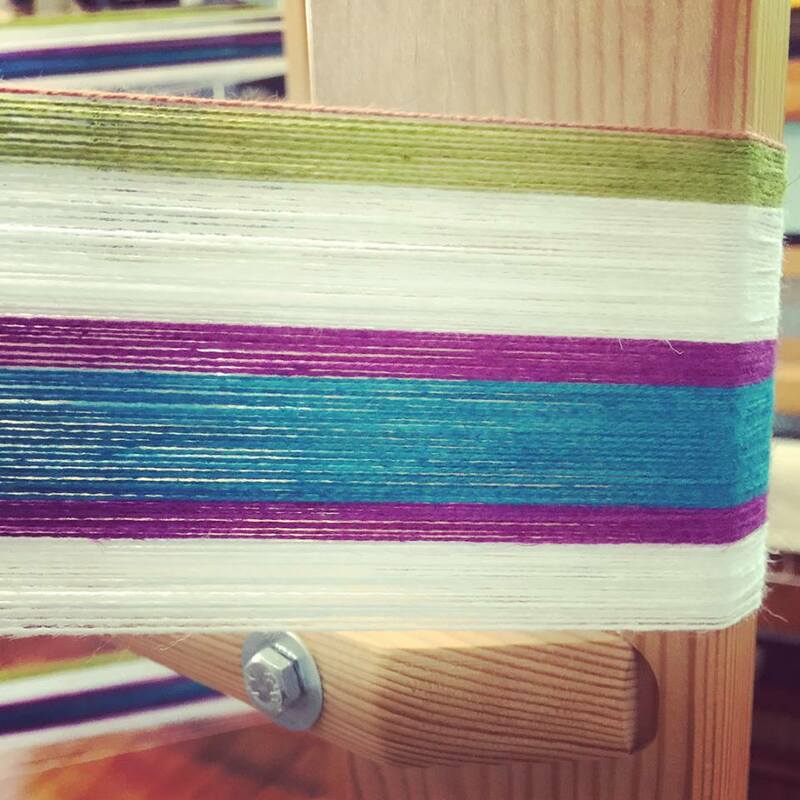 At that time, I was also employing a warping board to prepare my warp. Since then, I have acquired a Glimakra warping mill, and gave the board to a good friend of mine. There was a bit of a learning curve when I moved from the board to the mill. First, I found the board was a good bit more accurate than the mill, as each thread was exactly the same length as every other thread. This may have been the result of pulling one thread at a time and taking more time to place it evenly, one right after the other. 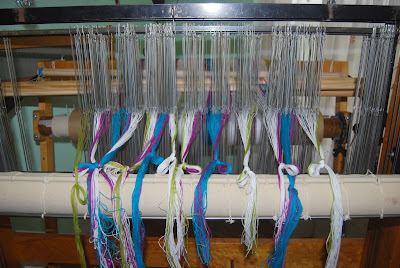 Second, the mill was a great deal faster, especially when using a warping paddle for multiple threads at a time. A warping paddle can also be used on a board, I just did not know that at the time. Third, I had a lot more knots and tangles when using the warping mill over the board. This made beaming the warp my least favorite part of weaving. I had almost resigned myself to this was the way it was destined to be, when I bought a loom (Leclerc Nilus 36" 4-shaft) that had a sectional beam. Over last summer, I acquired each piece of equipment needed to be able to warp sectionally, and I loved it! So much so, I saved my money to add a sectional beam on the existing 56" Macomber. Earlier this year, I acquired a smaller 32" Macomber with a plain beam. While I have a sectional beam on order for her, she is fully functional and to use her now, I have to prepare a warp on the mill and beam the warp back to front onto her plain beam (again, my least favorite part). However, I had begun to notice that skilled weavers, like Karen at Warped for Good, prepared their warps in several different chains, rather than one single chain, as I had been doing. In this post, she has a photo of eight different chains for a project. 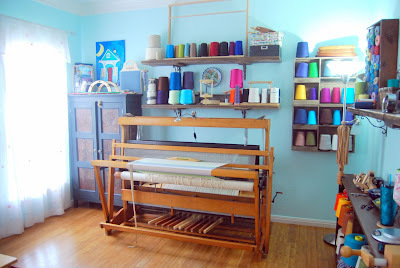 In the past, I have used two chains for a project, but that was only because I ran out of room on the pegs of the warping board to prepare the entire project and was forced to divide it in two. It had not occurred to me to divide the project into several different chains on purpose; however, I read somewhere that someone mentioned the more chains, the less the threads tangled and knotted. That alone was enough of an endorsement for me to give it a try. 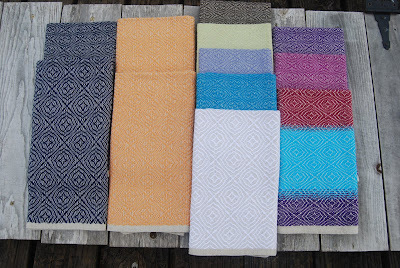 A few weeks ago, I decided to prepare a warp for these towels, and I discussed the project and materials here. I divided the warp into four different chains. 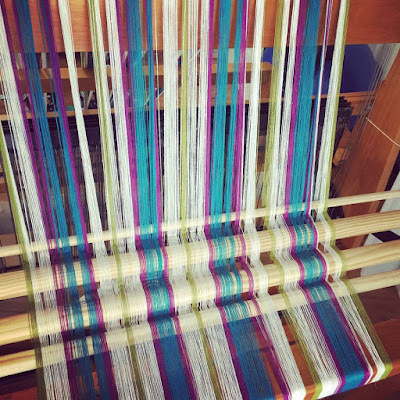 As I already had a warp on the little loom, all four chains hung in my studio for a couple of weeks, but somehow, I did not get a photo of them. This loom was made in 1968. When she came to me, she did not have lease sticks. Because I have a sectional beam on order, I decided not to buy lease sticks for her, as I plan to beam primarily using the sectional. Instead of lease sticks, I used different size/weight dowels that I happened to have on hand. Also, it is my preference to use a double cross, which requires four dowels. In case someone is wondering, I attach the dowels between the castle and back beam with a nylon cord which is tied to the castle. The cord is probably 2 yards long and divided in half at the castle. To attach the dowels, I twist the cords in front of and behind each dowel, then secure the ends to the back beam on each side. The dowel closest to the back beam was shorter than the rest. To keep it from slipping out of the cord, I added rubber bands to keep it in place. In addition to the separate chains, I also decided to try to beam this warp solo. Usually, the handsome husband or a friend helps me. 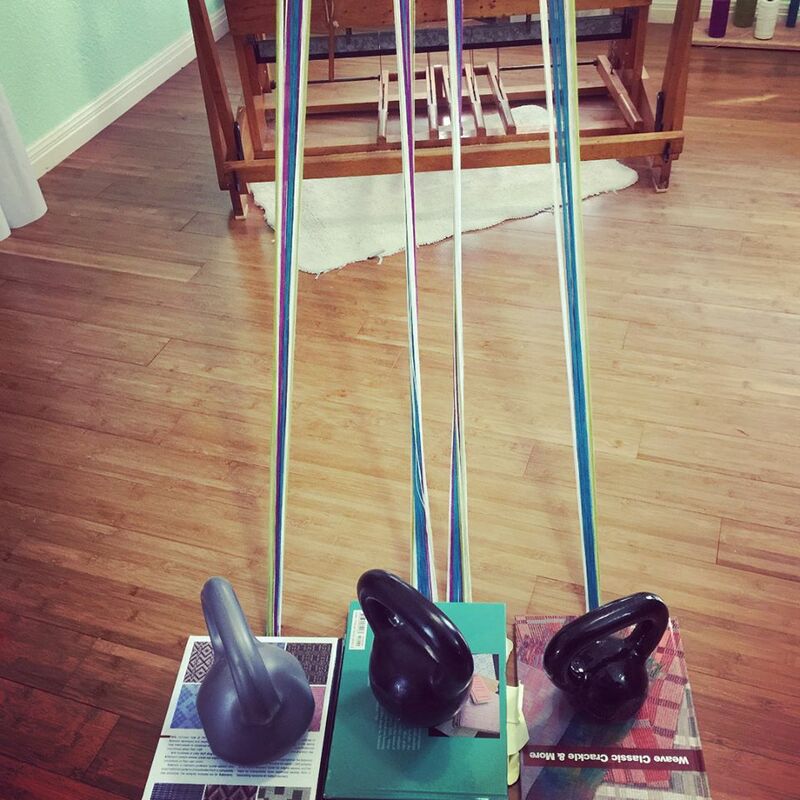 This was actually the second time I used books and kettle bells. There were NO knots or tangles in beaming this 13-yard warp!!! There were NO snapped warps, either!!! In all, it took about 45 minutes for me to beam this warp. Most of the time was spent checking the threads at the crosses and moving the books/kettle bells back away from the loom (as they slid forward, as I wound). For the last 1.5 to 2 yards, I did ask the husband to come in and hold the tails to wind on the last bit, but otherwise, it was a one-woman job! When the husband and I warped this little loom last time, we put on a ten-yard warp, and it took TWO HOURS because of all the knots, twists, and tangles. We also snapped two warps. Now, allow me to add, the prior warp was 10/2 cotton and the current warp was 8/2 Cottolin (60% cotton and 40% linen). 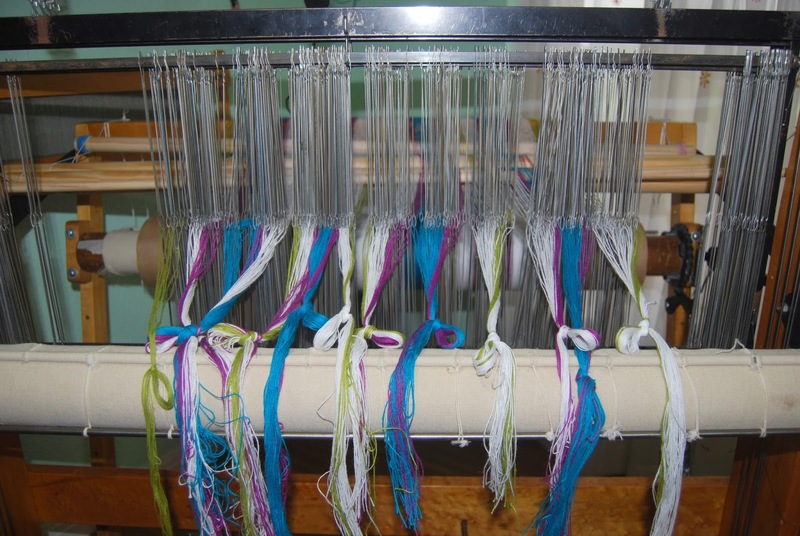 The content and size of the threads is probably a factor in the difference in warping; however, I firmly believe the separate chains was a greater factor in the ease with which this warp went on. While my preferred method of warping remains sectional beaming, I do like preserving my options. 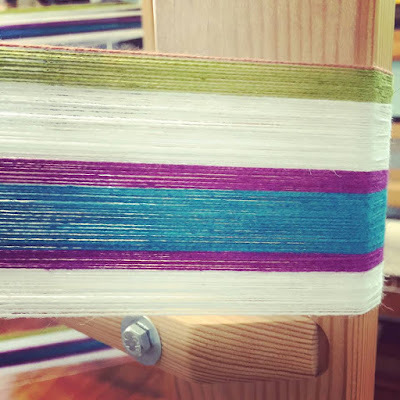 There are times when it is easier to prepare a warp using a warping mill, especially when using a wide array of different colored threads in a specific order, as I only have 50 spools to use at a time with the tension box, etc., for sectional warping. When I left the loom Sunday afternoon, all I had done was beam the warp. I had not begun to thread the heddles or even count them out on the shafts yet. Last night, after I returned home from the office, I was not in a big hurry to begin threading, as I knew it would take several hours. By seven, dinner, the dogs, and the dishes had been taken care of, and I actually did not have anything pressing to do, so I figured out how many heddles per shaft were required for the pattern and began threading the 493 ends. I was amazed at 9:15 when I looked up and had six more ends left to thread. Tonight, I will tie up the treadles, sley the reed, and lash on! 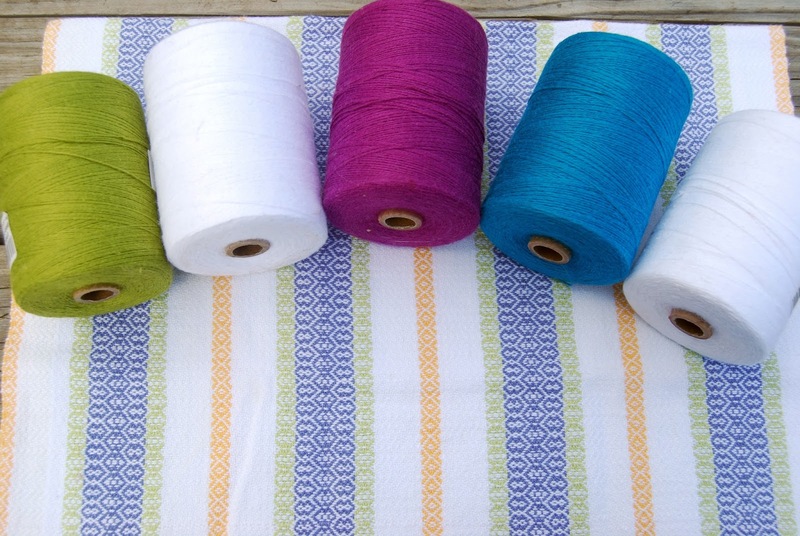 I expect to be weaving on these very soon. In other news, I have two 10 yard pieces of woven fabric for eighteen (18!!) tea towels awaiting washing and hemming. My sewing machine and serger have just returned from being cleaned and serviced (that was a story in itself), so there will be some pretty projects to share shortly.